Exciting two tank dive charter exploring a Shipwreck and then a Reef dive site. We explore the best dive sites on Oahu, being either the Sea Tiger shipwreck or the YO-257 shipwreck with depths each of around 100'. The second dive site will be a shallower reef with max depth of 50' perhaps encountering Hawaiian green sea turtles and reef sharks. We limit our group sizes to no more than 6 onboard. It's a unique dive boat in Honolulu because of this, most boats bring out group sizes of 20 - 30 onboard. Why dive with a company that doesn't own a boat or uses a cattlemaran jammed full of 30 divers? Smaller size groups equate to increased safety and greater fun! Arrive at our 36' dive boat located at Kewalo Basin harbor and gear up for an exciting Shipwreck/Reef tour in Honolulu. Your instructor or dive master will give a dive site and safety briefing on the short boat ride to either the Sea Tiger shipwreck or YO-257 shipwreck. 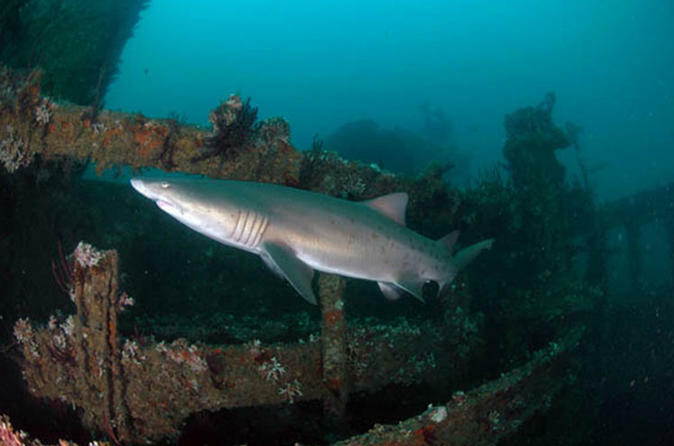 Experience the best scuba diving location on Oahu by exploring the submerged shipwreck. You may encounter schools of tropical fish, Hawaiian green sea turtles, eagle rays, octopus and white tip reef sharks. After a 30+ minute surface interval we will venture over to one of the vast Honolulu reefs. They may be teeming with Hawaiian reef fish, green sea turtles and white tip reef sharks. upon returning your instructor or dive master can stamp/sign your logbooks. Your dive log information will also be available for you on our blog. All of the underwater pictures we took during the day are available free of charge to download on via our website.